Scott Walker at Walker Corporate Law. Scott loves startups and shows it, with fixed-fee pricing. Have a question? Email him directly, scott@walkercorporatelaw.com, and tell him Jason sent you. After figuring out your product-market fit, there is nothing else your startup should be doing other than making sure you are getting that hockey stick growth. 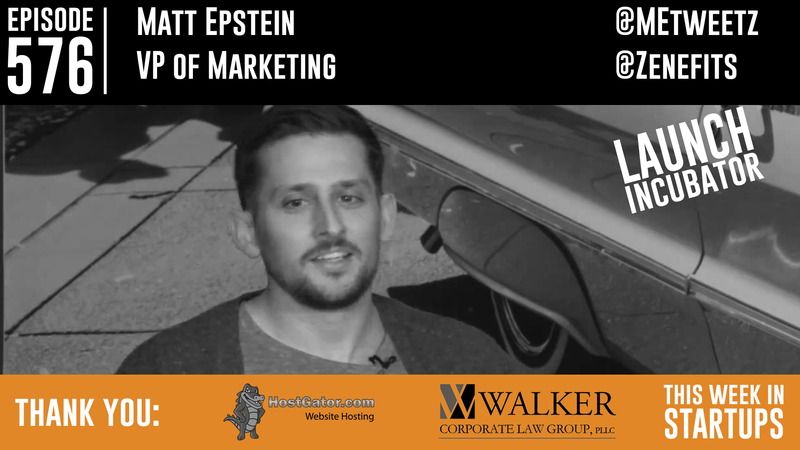 Matt Epstein, VP Marketing at Zenefits, dropped by the LAUNCH Incubator to tell us exactly how it’s done. Matt was the first employee hired at Zenefits and has been leading the charge on their monumental growth over the last 3 years (from 3 to 1,200 employees and $0 to $21 million in annual recurring revenue!). Matt opens up the “Zenefits playbook” for how they achieved this massive growth, which consists of: finding product / market fit, scaling with machines, scaling with people, and then doing everything else you can to get growth. Matt teaches why finding your “secret sauce” is so important because it gives you data on what the best way to sell your product is, how to scale with machines in search of repeatable SaaS metrics, what to look for in scaling with people (and what types of people you need to hire right away), what three essential questions you need to ask when hiring your first VP Marketing, VP Marketing Operations, and Sales Development Reps, what the five biggest screw ups they had at Zenefits were and how you can avoid them (i.e. 10x your goals!). Don’t miss this! Special thanks to the members of the TWiST Backchannel Program!